We were so happy when we were asked to provide illuminated centerpieces for First Lady Michelle Obama at the Taste of Boston on October 30 at Boston’s Park Plaza Castle. We worked up a few different shapes and sizes featuring the 2012 logo as well as the newer "Forward" logo. We were looking forward to participating in the energy to re-elect President Obama, and to have a chance to listen to Michelle's encouraging words. Then Sandy barreled his/her way up the coast and put an end to this and many other scheduled fundraisers leaving us with the now homeless centerpieces. We have been lighting them here in the studio and will have them all out tomorrow for election day. 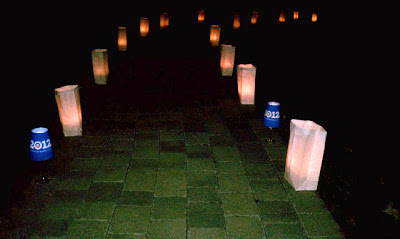 Last night we participated in Needham's first Luminary Stroll to benefit our Community Center. It was a beautiful start to what we hope will be an annual tradition here in Needham and one we feel particularly attached to visually! It was delightful to see so many twinkling lights placed in front of homes and along driveways, and we loved the flicker of the candles in the night. We had a few wineglass shades in our studio and couldn't resist adding them to the mix! 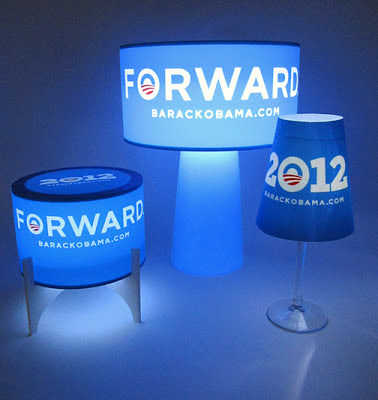 Our Obama 2012 Wineglass shades! 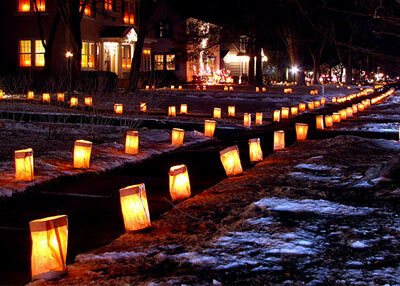 The original luminaria was a series of small bonfires lining the roads. Luminarias are associated throughout history to ancient traditions of communicating and celebrating through connected bonfires. In the early 1800's, US settlers in the Southwest brought beautiful Chinese lanterns to hang from their doorways instead of building bonfires. But the Chinese lanterns were too fragile. In the 1820’s, when Yankee traders brought brown paper sacks down the Santa Fe Trail people began to make small paper lanterns out of paper sacks as an alternative to bonfires. Today they are used to line sidewalks, driveways and walkways as a way as a way to be open and welcoming to neighbors and community. We try to create a similar sense of warm personal communication with our internally lit decorative pieces. Thank you Needham for the inspirational evening! 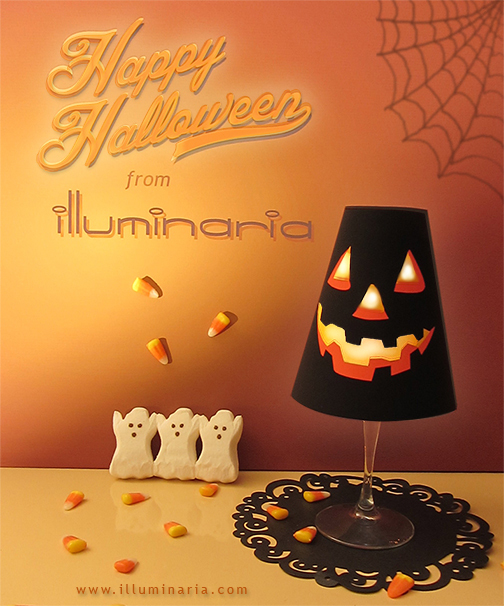 We were so busy this last week, what with Sandy and preparing for a festive Halloween, that we neglected to post this year's card featuring our pumpkin wineglass shade.